Whether you’re new to goose hunting or a seasoned professional, a goose call is an unmistakably essential part of your gear arrangement. This will vary based on what type of goose you’re hunting and where you’re hunting them at. We’ve put together this goose call buying guide to help you choose one, so your next hunt can be your most successful yet! First off, let’s look at some things you’re going to want to know before you start shopping. Material: This refers to what the call is made out of. The most high-quality calls are made of acrylic. Polycarbonate is an alternative that is still durable and costs only a fraction of the price of some acrylic calls. 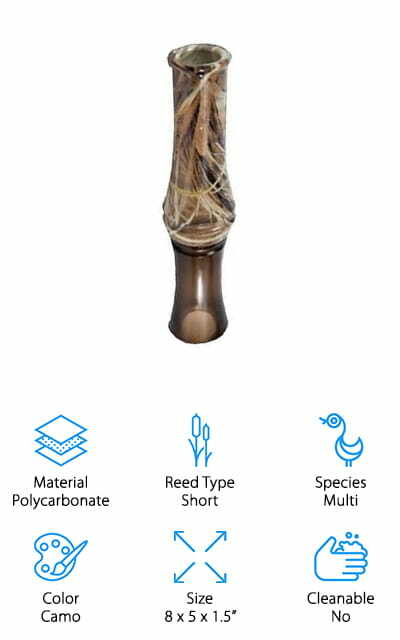 Reed Type: Short reed calls are the most common on the market now. There are also shaved reeds, which produce very specific sounds based on how they’re shaved. 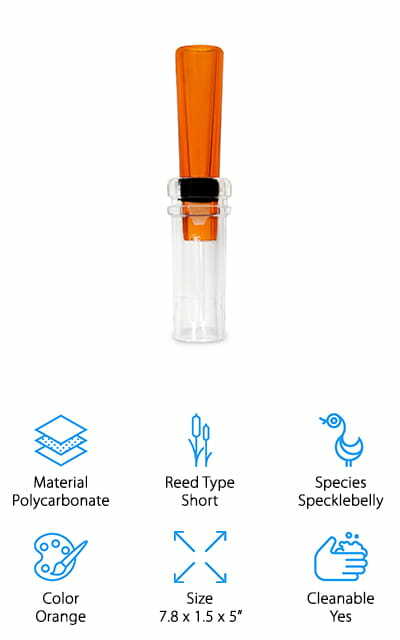 Flute reeds are longer and work better for certain species. Species: Each species of goose has a different ‘voice’ and a different call. You need a device that mimics the exact call of each species you’re trying to hunt, or it won’t work right. Some calls, however, are used for multiple species. Color: This I the color of the call. Some calls are really bright, vibrant colors to make it easier to find when you’re hunting. This is more of a personal choice than a functional one, however. Size: Flute calls are going to be bigger in size than short reed calls because of – you guessed it – the length of the reed. Size determines what type of honks, murmurs, or yodels the call can make; shorter reeds sound deeper. Cleanable: Some calls can be taken apart and cleaned. Always make sure of the direction so you don’t damage your call. This happens a lot in calls that have adjustable reeds, so they are made to be taken apart. Know what you’re looking for? Great! Our goose call reviews are compiled from a selection of calls, to bring you the best of the best! If you’re in a hurry (being called away?) check out our top pick and budget pick first, as they’ll give you a good idea of what’s out there. The rest of our list holds some pretty promising calls as well, and you just might find the perfect companion for all of your goose-hunting adventures. The Power Clucker is the best Zink goose call out of their lineup. It has the same quality and durability as an acrylic call, but for a fraction of the price! It’s made of polycarbonate, so it’s easy to use but rugged enough to handle season after season of use. There are so many people that have had great amounts of success with this call. It’s been hand-tuned to deliver the best sound possible, from people who know geese. The short reed design produces all manner of mellow and deep calls. The easy-blow system means that it’s the best goose call for beginners. You can make a wide variety of sounds with very little air or effort. 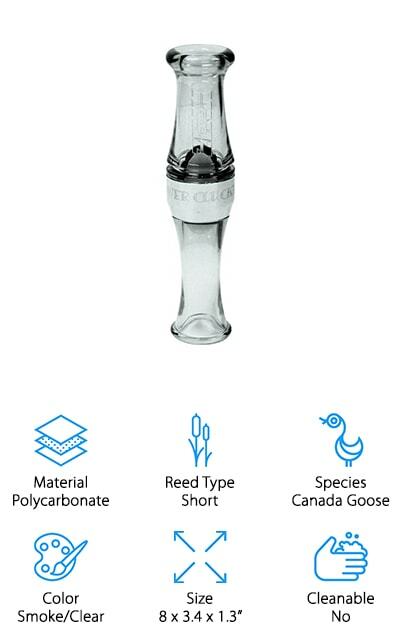 The short-reed design decreases the amount of back pressure you need to apply, making it the perfect call to learn on. With so many people leaning on this call for their perfect hunt, we couldn’t help but recommend it to you! 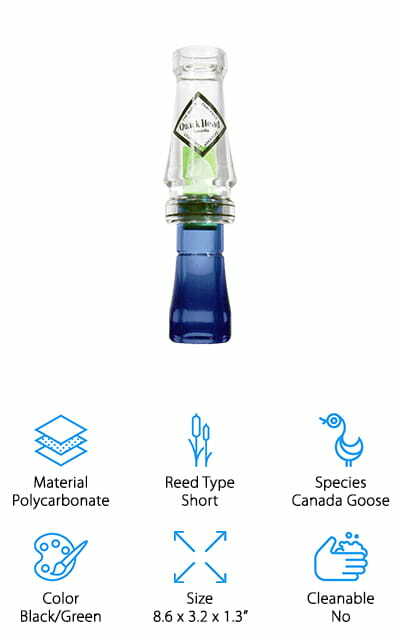 Faulk’s Deluxe call is one of the best cheap goose calls we looked at. It’s made of high-quality cherry and walnut wood barrels, so it makes beautiful, mellow sounds that are perfect for a wide variety of geese species. Due to the way this call is constructed, with the proper positioning and airflow, you are able to replicate the sounds of just about any goose species with accuracy! It takes some practice to get it right, but this is the perfect call to master. The sounds this thing makes are beautiful! It’s a short reed call, so it’s good for beginners, and it’s the perfect call to hone your skill on as well due to the versatility of the calls. It’s a multi-purpose, multi-species powerhouse that will help you attract a large variety of geese for your perfect hunting experience. On top of that, it’s a fraction of the price of some acrylic calls on the market. This is the first acrylic call on our list. Primos is known for quality materials and satisfactory products across the board, and this call fits right into their line-up. The design helps to create a hyper-realistic sound that will have geese running to your location! It’s super loud so they’ll be able to hear you at greater distances. On top of that, it’s really easy to use. It creates minimal amounts of backpressure, so it is easier to call no matter what skill level you’re starting at. There are ‘ditches’ crafted into the sounding board, so the call won’t ‘stick’ on one sound due to moisture on the reed. This also makes it perfect to take apart for cleaning. 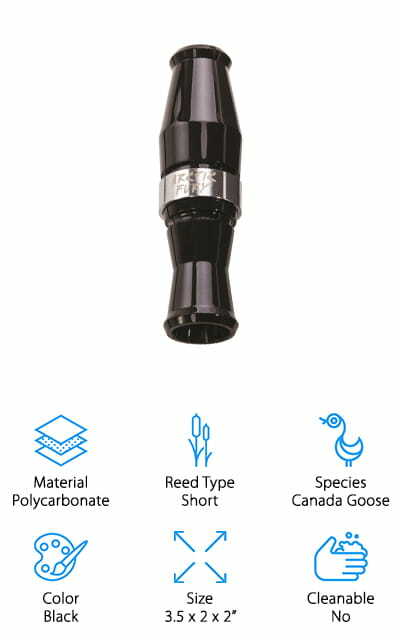 The Primos Honky Tonk Call is one of the best goose calls for sale right now, with its durable construction and thoughtful design. We love that it’s cleanable so you can get the right call every time! The “G” call is one of the best Tim Grounds goose calls made. 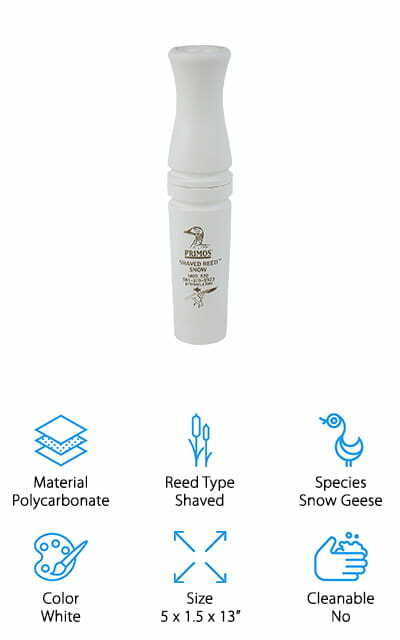 Though it is recommended for use to hunt the Canada Goose, it can produce a wider variety of vocalizations on it short reed that is sure to make even other species of geese interested. The mouthpiece features Air Flow Control technology, which allows you to control everything about the call just by altering the flow of air into the piece. All of the guts, including the reed, are “Triple Crown” rated, so you have great volume control and can make a wide variety of sounds, including different loud and soft sounds. Softer sounds are sometimes difficult on other calls, but not on this one! There is very little effort needed to produce high-quality, effective sounds that will bring the geese to you. It might take a little practice and learn to get the exact sounds you want, but it’s easier with this call! The Rich-N-Tone Goosezilla Call is simple to learn, easy to use, and is constructed for long-lasting use. You won’t have to replace this call anytime soon. It’s perfect for recreating the voice of the Canada Goose, even down to the lowest of their honks. 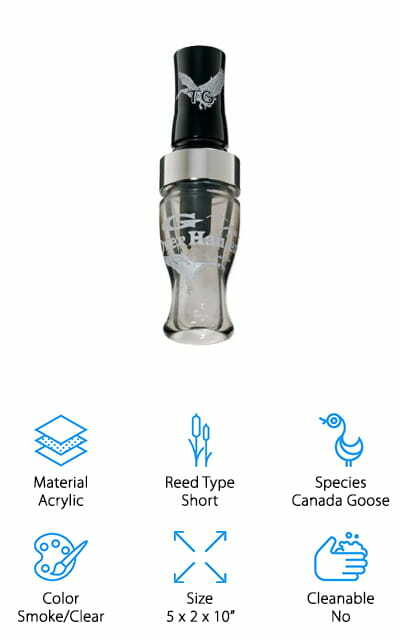 The sound quality and volume mean that the calls travel a medium distance to draw geese to you, so you will get just the number of geese you need for the perfect hunting experience. The back pressure it produces isn’t overwhelming and is actually very constructive for learning the different calls and producing the volume that you’re going to need. We’d call the Goosezilla one of the best short reed goose calls we looked at for the quality, price, and even the unique colors and construction. Those Canada Geese won’t know what hit them! 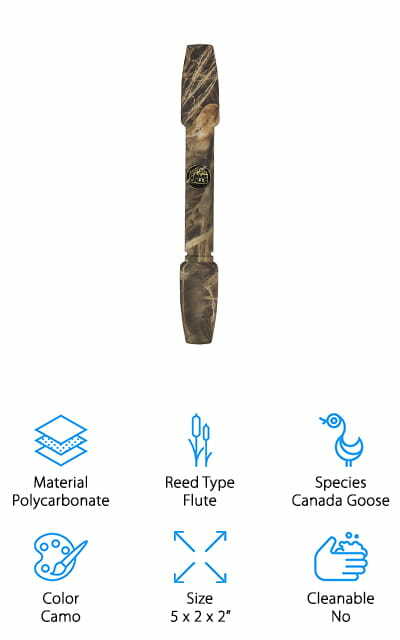 The name of the Flextone Canada Goose Call is deceiving because it can create a variety of calls for multiple species of geese, not just the Canada goose. It’s a stylish camouflage color, which a lot of goose hunters will be really happy with. The bell piece on the inside of the call has been improved from their previous models, increasing the amount of control you have over the tone, volume, and back pressure levels. This allows you to make a full range of natural-sounding calls, including the elusive and difficult double cluck sound. In fact, they’ve improved this piece so much that we’re happy to call it one of the best sounding goose calls on our list. We were really impressed with the sound this thing can produce! It’s no wonder that it works for multiple species of geese. They won’t be able to resist answering this call! Flextone wants you to be prepared for close encounters – you’ll have to be! This Primos call is one of the most unique calls on our list. Snow geese have one of the most challenging voices to replicate, and there are so few calls that do it correctly. But this call is definitely one of them! It produces an astounding amount of volume with very little air required. It has a shaved reed, which means that the reed is thicker in some places and thinner in others. In this model, the middle of the reed is thicker to stand up to more forceful blowing, while the tip of the reed tapers off really thin for sensitivity to air flow and accuracy of sound. The result is overwhelming realism – even for the unique ‘growl’ of the snow goose. 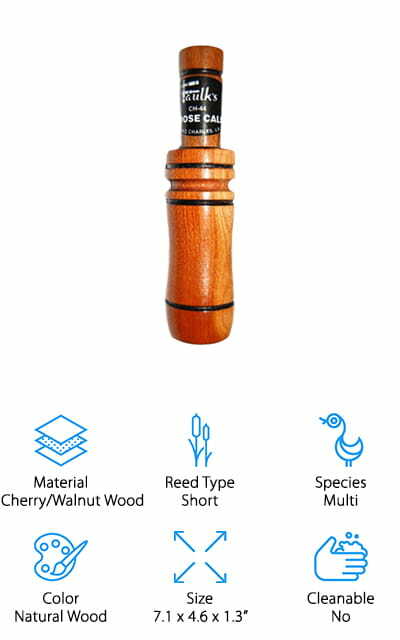 This is probably the best snow goose call for that unique design. You have to blow much less air into the mouthpiece to get the sounds you want. It’s so easy to use! Flambeau is back on our list, this time with their Arctic Fury call for Canada geese. It gives you super realistic tones, including the double cluck that everyone wants to make. And it’s regular cluck isn’t bad either. It’s made of polycarbonate, but it produces a deep guttural tone that will attract geese to you. Even they won’t be able to tell the difference! 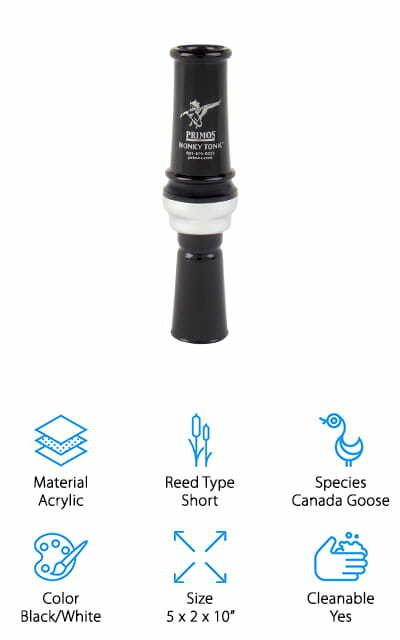 The lightweight, durable design and affordable price make this one of the best goose calls for the money. It’s really loud as well! There is special technology in the guts of this call, and it’s shipped with those guts already sounding as though they’ve been ‘worn in’, so there’s no awkward period for breaking it in. You’ll get perfect tones right from the start! Flambeau is a wonderful company that makes a plethora of goose and duck calls, but this is one of the best. They’re on our list twice because they make quality products! Duck Commander might be one of the best-known names in hunting calls nowadays, but that doesn’t mean they skimp on quality at all! This Polycarbonate call is unique on our list for being specifically made for the specklebelly goose species. It comes with all the bells and whistles – it’s short reed, which means that it requires less back pressure to work it, and it doesn’t take a lot of practice to get the basics down. Mastering every call isn’t that difficult either with a little bit of instruction and practice. It’s easy to clean because you can take it apart to manually adjust the reed. The friction fit reed system is unique to this brand, and it allows you to product the yodeling sounds, murmurs, and purrs that geese love. With this range of sound, you could be talking back and forth with flocks of specklebellies in no time! It’s also a bright orange color so you won’t lose it!